The suspension system maintains full floatation range to prevent gouging or scalping when going over undulations. 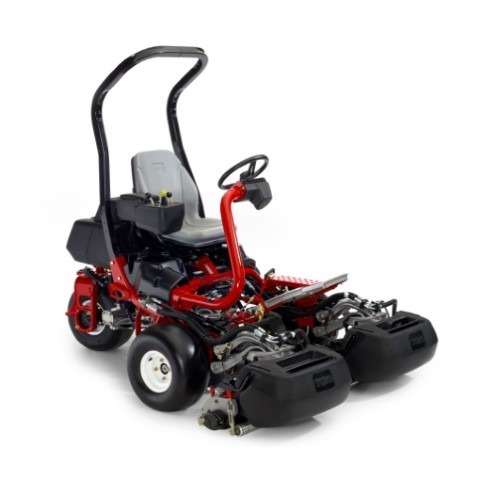 Superior contour following capability utilises an integrated “Flex” linkage system to allow cutting units to pivot around the centre of the front roller to master undulations and prevent side-to-side scrubbing of the putting surface. Precision manufactured cutting units with minimal adjustments and the proven ability to maintain adjustment for longer periods of time provide superior cutting performance. The suspension system is designed to provide a slight lift to the inside of the cutting units during turns to deliver a consistently level cut and to reduce `triplex ring` for improved playability and turf health. Easy access to the center cutting unit facilitates routine maintenance and repairs, simplifies adjustments, and eliminates the need to put the traction unit on a lift for cutting unit service saving you time, money, and frustration. A single operator can go from cutting Greens at 1/8` (3.2 mm) to cutting a Fairway at ¾` (19 mm) in just a few minutes. The tool-free, quick-change cutting units make it as easy as 1-2-3. Redesigned clipping capture system maintains a consistent gap between the basket and reel to retain nearly all grass clippings for a cleaner and healthier cut. In addition, a discharge shield forces clippings inside of basket and minimises “blow-by”. Tires have been redesigned to deliver uniform loading across the entire cross-section (load footprint area) to eliminate side wall loading that can create visible tyre tracks. The Triangle Wheel Stand places the rear wheel track within the radius of the front wheel, which prevents accidentally dropping the rear wheel into a nearby sand bunker while making the turn for the next mowing path. Ten miles per hour (16.1 km/h) transport speeds will allow you to stay ahead of golfers and get more greens cut in a shorter time. The dependable Turf Guardian™ leak detection system provides immediate audio and visual indication of possible hydraulic fluid leaks.